User Interface is the visual part of your product; this is where all your back-end gets exposed. This is where your users interact with your application tier, middle-tier, database-tier, third-party & whatever-tier. The user interface could be visual, wherein for web products you have HTML pages interacting, for desktop-based products it’s your screen (or window) where the user interacts by clicking links, submitting forms, scrolling windows, or even closing the application. 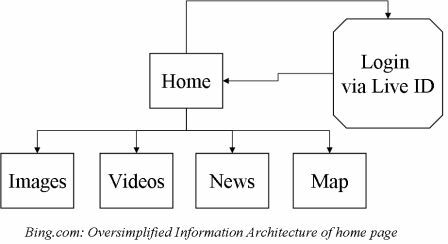 Information Architecture This is the sitemap & structure of your website. 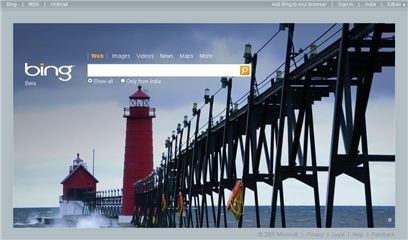 For example, when you visit http://bing.com what options do you have for interacting with the site, some include (a) Typing a search query & submitting the form (b) Clicking on maps link (c) Clicking of the about us link etc. These three options represent navigation pattern, the conceptual layout & the flow (form submissions showing a result page) of the pages. However, The Information Architecture does not depict logic of page flows, but just linkage of pages. 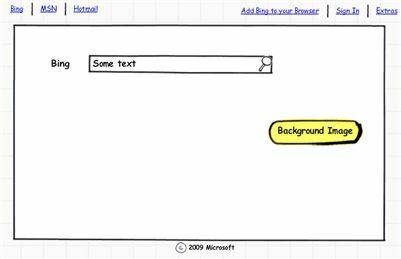 Here is a simplified Information Architecture of bing’s home page. Interaction Design This is the flow chart of your website which captures a lot of details which shows how the pages could interact with each other and under what conditions. For example, a home to login linkage on the Information Arechitecture would show a linkage from the login page to the my dashboard whereas the interaction design would capture how the user can or may not be allowed to navigate from the former page to the latter. A login interaction has logic to check for user name & password validity, account expired/active status, session timeout, etc. The interaction design builds upon the elements of Information Architecture (the “login” & “my dashboard” page) and applies logic to connect them together. 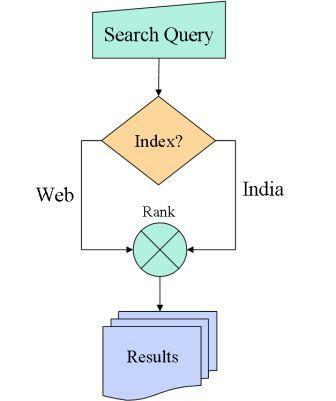 Here is a simple interaction depicting which “index” to be picked up for the given search query. Who does what? What are the roles & responsibilities? 1. Product Manager Overall responsibility. Creates the Information architecture. May take help of software/system architects for existing components and their behaviors. May engage web designer for existing sitemap & functionality. For startups, the Product Manager role may be assumed by the CEO, CTO or an architect on board. 2. Visual Designer Does final mockups based on wireframes and IA. May also do the final HTML/CSS. The user-interface once connected to the back-end becomes complete & is revisited for usability testing, customer feedback, focus groups, scenarios etc. More about them in a future post. One of the biggest dilemmas faced by an entrepreneur who is starting up is to figure out when to stop building and when to start selling. Although, easy it may sound there are no hard boundaries between one or the other. Once, you have 5-10 people in the team then the question is different — you can have half of the team building the product and the other half selling it. What do you do when you have have 2-3 members in the team? The idea is simple — build an initial set of features and then instead of only building, you, build, sell, build, sell. Repeat. Put a constraint that for every 5 new features, you acquire double the number of leads (or users if you are a consumer internet product) than the last time. That would be a perfect balance. Here is a chart depicting a hypothetical idea where for every 5 new features you add to the system, you double the number of leads you acquire (or acquire users for consumer internet products). ‘R1’ in the figure below represents a baseline set of features for acquiring first set. Requires great discipline. As a coder-entrepreneur you may wanna go into the “comfort” zone of continuously building or if you are a non-techie entrepreneur you may just sell without a product in hand. Both are extremes and equally detrimental. Especially, in Indian conext where capital is meager and having the revenues in the books is golden, you strike a balance until your next inflection point where you are cash-flow positive. Build an initial version of the product which has some baseline features. These features may be targeted or have been developed after talking to a set of potential customers. Call that base version as alpha, beta, R1, whatever. Sell the product or convince your leads to start using it. Maybe a small set of people would start using it. Don’t start building new features, just yet — Talk to them. Get feedback. 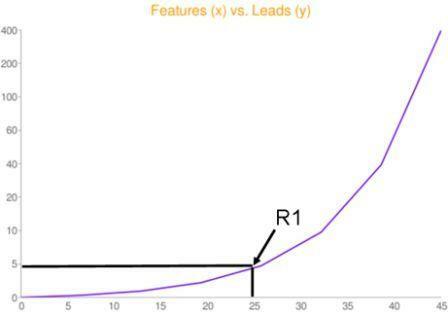 Now, don’t go incremental, go exponential in acquiring leads (or converting them). For every 5 new features, try to double your lead flow. (The above example; for consumer products however, you may add few zeroes to the y-axis legends to get the point). Visitation rights is a term used when a mom/dad gets the right to see his/her child on a fixed interval basis. Most of the times, visitation rights & monetary support are also intermingled. This is what is my observation of funded startups in general in India. They raise money — the investors come & “visit” them time to time — Best, you send weekly reports and harness few contacts in their rolodex. Question to ask; are they helping you in building your business? Entrepreneurial ecosystem is in it’s infancy in India — resources are not available, event platforms are sparse, celebarations of success barely exist, peer support is meagre, etc. What we need is hand holding, support, building of business and not just money & remote supervision. Of course, money helps to reduce the friction of starting up — but it’s not the only lubricant required. Comes Morpheus Venture Partners, a Business Accelarator out of India which I joined as a Partner few months ago. Our vision is to reduce the friction of starting up & provide end-to-end support ranging from building your pricing model to finding the right technology stack for a startup. Of course, we want to provide money too, which we are working on. Less than 24 hours ago we announced our latest batch of 10 startups — each one of them is envisioning to bring a change using their model for people of India. Being a deep technologist, I always thought that the next big thing can only come out of technology and maybe the next Google is going to be from India. That’s very much a possibility but it’s hard to sustain a viable business when less than 40 million users are online (a large % of which use the net only once a week!). Adscoot’s Suyash, stands for hours in the major junctions at mumbai to learn traffic patterns and measure footfalls! Viv & Hari of InterviewStreet are two rockstar techies who are consciously & fast learning other skills to take their product to market. They have the passion & drive to make things work! Shashank & Abhinav started on Naabo right out of college – the freshness in approach & the passion they bring with them is infectious. Arjun of Picsean is an engineer, but his passion towards photography is amazing! He’s a good friend & i’ve seen his focus and smart work in his past ventures. His attitude to learn is commendable! Robin of ReachTax is a star CA, but i love his humility and the motivational skill he has to make his entire team perform month after month! Pankaj & Gaurav quit their fancy paying jobs to work on Retail Vector. Focus, quick work and frugality of life is what they are committed towards as they scale this venture! The first thing that stood out when i met Abheek first was such an young guy and such maturity & humility. (Often age and humility dont go too well). This guy was 7 years old when he started putting Lego pieces into perfect ensemble & several years later, he’s using them at RobotsAlive! I read about these guys in a print article & the next time we were in Mumbai, we met Jayesh & Karthik of VeriCAR. Two guys crazily passionate about automobiles! Thanks to the startups for choosing us their ‘limited co-founders’, I’m sure this association is going to go a long way. Now, for the next 4 months, we spend dozens of hours every week with the founders poring over the details of their business and helping iron out every possible kink. Agreed, we can’t change how users would percieve their offerings and how big they could possibly get — Yes, we can influence the positive outcome to a great extent.